Thanks for everyone who came to the meet-up. Our guest this time was Mayor of Seattle and Sound Transit board chair Greg Nickels. Nickels was awesome, he gave a history of Link and Sound Transit that only someone who has sent years leading the fight for light rail can, and spent a long time answering questions about light rail, streetcars, transit oriented development and buses. It was a great meet-up, and I’m always impressed by the transit acumen our readers have. We’re really lucky to have such smart readers. Also present was Shefali from TCC, who I want to encourage people to contact for Link opening event volunteer opportunities. 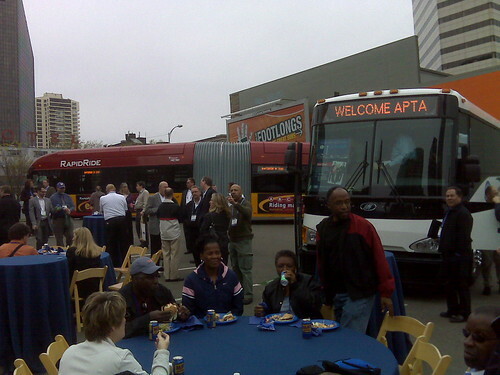 Seattle is playing host to the American Public Transit Association’s Bus and Paratransit Conference, and Metro unveiled its Rapid Ride BRT buses, as well as bus stops, more photos below the fold. I am really excited about Rapid Ride now. And I can’t tell, is that Flyer? Is it still on display? That’s not a real stop. Ah, just checked on New Flyer’s website, it’s pretty much the same. But it still looks a lot like the Oscar Mayer Wienermobile. Why does it take so long to get the Rapid Ride lines started? Metro has less than no money. Sim’s Transit Now measure the voters passed in 2006 to increase our sales tax by one-tenth of a percent was supposed to raise $50m to $75m annually to pay for Rapid Ride and other KCMetro bus service increases. With the economy tanking the past year the revenues are probably not anywhere near that rosy projection. But still, what happened to the revenues raised in 2007? Did they just fill a big hole KCMetro was already experiencing? I heard the buses are also backlogged at the manufacturers’, so Metro has to wait for each one. Just curious, how do they know you tapped your ORCA card before you boarded? What’s to stop someone from boarding at any of the doors and just not pay the fare? There will be fare inspectors, like Sounder and Link. Most European bus lines do that too. It’s my opinion that the driver shouldn’t be responsible for fare collecting anyway. London’s transit cops have handheld readers, no larger than an average smartphone. They claim to do random searches, but in the five months I spent in London, I only got checked on a bus once. (I would guess this has something to do with the obscenely large security camera network they have, but I couldn’t possibly say for sure.) The lady in front of me got a 30 pound ticket for (d’oh!) not tapping in her card that had sufficient fare on it. The cops threatened her with a 95 pound ticket and a summons if her card was found to have insufficient fare (and, ostensibly, she would kicked off the bus, too.). I imagine that we will see something similar, although the checks will probably be more frequent. It’s just a bus. BRT costs more money, but it bounces like a bus and it will be stuck in traffic like a bus. BRT is used to justify (or trick people into) not making the proper investments to create reliable transit infrastrucure. In general, that’s my view as well. We do have BAT lanes for this, which will help, and hopefully the political capital to keep them around, but yeah, all this really does is help us build ridership in corridors where we can build rail later. yep and then we can move the buses running that BRT to another corridor and start the process (LR, Monorail, PRT, whatever) again. That’s the beauty of BRT. Where has BRT been upgraded to another higher-capacity mode on a non-dedicated mixed-traffic corridor? 98 B-Line from Richmond to Downtown Vancouver runs for the most part in mixed traffic except for a busway in Richmond. The busway was removed years ago to make way for the Canada Line. The B-Lines don’t even have next bus displays (no longer working) and no off-board fare collection (3-door loading with pass/validated fare like RapidRide). Do you want to take that assertion back? Carl. Pssst. Buses are an important part of a good multimodal transportation system. It’s okay to be an extreme rail enthusiast, but that doesn’t mean you have to be angered or threatened by other forms of transportation. Sam. Pssst. Rail is an important part of a good multimodal transportation system. It’s okay to be an extreme bus enthusiast, but that doesn’t mean you have to be angered or threatened by other forms of transportation. “I know you are but what am I?” Grow up. I’m not opposed to buses, I ride them frequently, and they clearly are a necessary part of any transit system to serve lower demand areas. The single biggest improvement to any bus corridor is to reduce headways. The time it takes to travel a given distance is the wait time plus the travel time. If you are at an event, appointment, or shopping, or transferring from another bus, you don’t know when you’ll be leaving, so the headway or wait time can’t be controlled by arriving at the right time. Reducing headway can be a lot cheaper than reducing travel time. In addition, once you are on the bus you can read and are protected from weather and feel like you are making progress. A lot of the BRT investments don’t seem to do all that much for riders – I’d rather have a bus on a 10 minute headway than a bus on a 15 minute headway with an information system and off-vehicle fare collection. Unless a BRT line has dedicated right of way or enforced private lanes plus signal pre-emption – it’s just not any faster than a regular bus, and I don’t think the investments in more expensive buses and bus stops bring very much to the rider. When BRT is used as an excuse not to build a high capacity system, or diverts that money, it does a dis-service. Has anyone taken the Silver Line in Boston from South Station to the airport? They call that BRT. It seems like the most asinine system I can possibly imagine. It has taken me 30 minutes to go 4 miles from South Station to the airport. It doesn’t seem to go more than 30 mph. Even the dedicated corridor has intersections with streets with no signal pre-emption. And even though all of the line was built in conjunction with the Big Dig and Ted Williams Tunnel, after the final stop in the busway, it then makes a 180 degree turn back towards South station on city streets, through several traffic lights – i think it backtracks past two of its outbound stops – before then making another 180 degree turn and then running in general traffic lanes and caught in all airport traffic congestion. The MBTA spent big bucks on this, as well as the Washinton street corridor which has lanes marked for BRT in which cars routinely park. Just call it a bus and run frequent headways and be done with it. When you decide to put in higher capacity, do it right. I rode it on one of its first days of operation during a visit to Boston via Fung Wah Van Hoolio (sorry about that joke). So they use Neoplans of the design presented to Metro back in 1985 (or was it 1984?) except now they’re low-floor. They take an entire minute to mode-change! Did I mention that their electric motors are the noisiest I’ve ever heard! And those Series 60’s sure blow out a lot of soot! It’s cost. It really is. The sooner we’re not using diesel, the cheaper things will be for us in the long run. Trolleys are one thing, but then they’re fixed, and then it is, again, cheaper to build rail in the long run. This route could be electrified easily. Diesel is not the major cost of running a system like this, (oil is only $50 barrel and looks like it isn’t going to get higher for a number of years.) Cost wise it’s the labor of the driver and the maintenance of the vehicle that kills systems like this. Oil isn’t going to get higher for a number of years? Gas was $4.30 a gallon this time a year ago and oil was $140 a barrel. It can go anywhere at any time. if these folks are right, it’s more than likely going back up again. If the A Line were to be electrified they would have to build overhead and trolleybus maintenence facilities at South Base which is around 4 miles from the north terminal. Or they could add another 2 miles of overhead and connect to the existing wire on Rainier but Atlantic Base’s capacity is limited and the deadhead times would be enormous. Or find a secondary base location. I really don’t see the trolley bus network extending beyond the Seattle city limits. Wait, that’s really not necessary. They could use dual-mode buses like the Neoplans in Boston’s Silver Line BRT and our tunnel buses. Does anyone on this list know when the Hubbert Peak Theory http://en.wikipedia.org/wiki/Hubbert_peak_theory was first put out? and why? This curve has been wrong as long as it was a theory. The fact that oil costs are down has more to do with the economic mess than anything else. That it was high last year had more to do with the speculation in the market by banks & hedge funds using our money! But yes, at some point the oil game will be over and the costs will rise, but it’s not going to eclipse the labor and maintenance costs for a long time. What kind of volunteer opportunities? TCC is looking for volunteers to answer questions and such on opening weekend. They need some 300 four-hour shifts over the two days, just to sit at tables and help people get ORCAs and such. Oh, not Tacoma Community College. I’ll ride this, even though it goes nowhere I want to go! I’m waiting for the C, D and E lines. I’m definitely going to ride it around when it openes. I love the three wide doors. How do wheelchairs board? I had hoped that the stops would include ramps that would bring wheelchairs right up to bus level. You can build the most rapid bus in the world, but if you have to wait for that wheelchair lift once, then you’re stuck waiting (ok, you’re also waiting in traffic, but they’ve made an honest attempt at fixing that). I actually asked the guy that was on the bus from Metro about that. In Vancouver, they have back-facing wheelchair positions. I witnessed the a guy in a wheelchair board with the ramp and back in to the spot. The user holds on to the stanchion for support. No belts, no harnesses, no driver intervention required. Very fast loading. Hmm… I guess my stepfather could sue Metro for broken arms and busted pelvis for the inevitable injury from this foolish assumption! If your wheelchair user is athletic and has more trunk strength than an elephant, then yes, holding onto a stanchion would work. And so far as I can tell, even the rear-facing securement areas do have tiedowns. I think you’ve misread what I said. Metro has the standard tie-down. Vancouver has those rear-facing positions (where tie-downs are optional) and they still have another spot with the regular tie-downs. That’s what I witnessed in Vancouver. See this photo http://www.flickr.com/photos/viriyincy/3494430713/ and video http://www.youtube.com/watch?v=k1iztddQ6rk for an example of what I mean. Don’t hit on the guy, he’s just the messenger. I have now read the TCRP report that you linked to and noticed that some systems have a securement strap while others do not. Thankfully, by law any implementation would be subject to ADA rules that require a full securement system. Too bad this isn’t real bus rapid transit. No dedicated right-of-way or special transit lanes, no signal priority, and no ticket vending machines at stops (ORCA readers don’t count since you need a card). The stops have reader boards telling bus times, but TriMet has had that and the cell phone system for years and Metro should have done that years ago as well. In the end, its just a fancy painted bus that won’t be any different than a normal bus. OH, wait, it has a 3rd door. I almost forgot. At least Community Transit is doing BRT almost right. Who said there was no signal priority or transit lanes? Pacific Hwy 99 has HOV lanes down most of the length of the route. 15th Ave W to Ballard has BAT lanes. Aurora will also be getting some more bus lanes (I’m actually working on part of that). For Tri-Met’s cell phone system, we have OneBusAway, all Metro needs to do is add the stop numbers to make it easier to use and they are going to have them when they replace the bus stop signs. Us volunteers should help promote OneBusAway, too. In yesterday’s meet-up, Brian Ferris said that Pierce Transit is going to use OneBusAway’s phone system. Metro can do the same, after they get their act together. Who says no dedicated lanes? Well, Metro has said that in every SBAB (Seattle Bike Advisory Board) I have attended where other transit modes have been discussed & Metro and SDOT reps have spoken. No dedicated lanes between West Seattle to downtown. Ok, we have ONE eastbound lane that runs about 1/2 mile on the WS Bridge. And ok, a “dedicated bus lane” during “peak hours” is planned, planned only, for Avalon from 35th to the bridge on-ramp. But between those points? And through the middle of the already crowded WS Junction/Alaska? Gridlock with no way out, esp. when the serious viaduct replacement work begins in earnest next year. No dedicated bus lanes are planned in the south/southwest part of the city. Sure, a Rapid Ride bus may try to show up every 15 minutes, but I suspect that may not be the reality. Add to my consternation that this route would replace the good 54 route, resulting in less stops and convenience along California Ave, instead of the 54X route, just makes me like it less. Unless they plan on expanding the sidewalk itself (those curb-bulbs that are planned are for loading/unloading correct?) the “bench area” will block the entire sidewalk. That’s unfortunate but true. West Seattle is screwed, yet again. SDOT is currently updating many signal cabinets to facilitate future Rapid Ride corridors. For West Seattle these changes will occur along SW Alaska Street, 35th Avenue SW and Fauntleroy Way SW. The cabinets and associated fiber optics will let our system detect buses as they approach signalized intersections. If a bus is detected and the signal is about to turn red for the bus, the signal instead will extend the green for the bus in order to reduce delays for riders. I’m not very familiar with West Seattle so I cannot comment on that without studying the area and the source of the backups. I did drove up through the Junction once during the PM peak and it was awful. I promoted OneBusAway to quite a few folks who stopped by the Transit Riders Union table at the Sustainable West Seattle Festival on Sunday. So how exactly is the A line any different than the 174 with skip-stops (that only goes to Tukwila/International Blvd)? Not that much different, it looks like. It won’t be able to replace the downtown-Federal Way express buses (which Sound Transit will supposedly add to replace the 194). And 15-minute headways is lame for BRT. But it’s a good step that can be improved incrementally later. As others have said, Vancouver uses BRT ahead of rail. If Seattle did this, there would be rail-equivalent buses from Federal Way to Lynnwood and downtown to Redmond now, so that people would at least have something until the rail can be completed. Currently only the downtown/U-district, downtown/Northgate, and downtown/Bellevue segments have anything even halfway approaching rail headways and express-ness. 15 minute headways are half what the 174 is right now with 10 minute headways during the peak hours and 30 min headways after 10 pm. 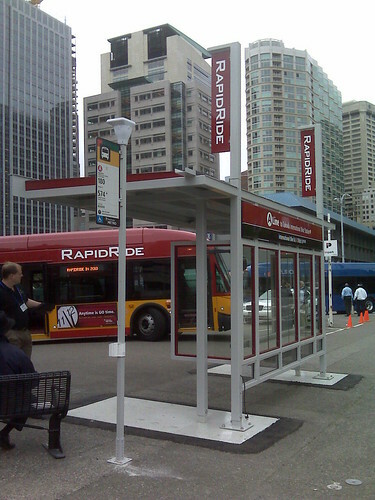 RapidRide provides 24-hour service. I don’t how different that will be from the current 174 owl trips but the schedule inside the bus gave me the impression that buses will run every 30 minutes all night. Also timed transfers with the 124 (day and owl), the replacement for the 174 north of Tukwila. Is Metro considering getting rid of the 174 too then? Picture #9 in the P-I article shows 10-minute headways at peak times and 15 minutes midday until 10pm. It doesn’t say that it runs at all after 10pm, although that part may be off the edge of the picture. if it does, it should really say so in the “Schedule: Weekday” section. Granted, this may just be a prototype sign with bogus info. It would be nice to see “2:15 and 3:30 night owl” service replaced by real 24-hour service like you almost have on the 7, but I doubt it, especially with the budget cuts. The cities that do have 24-hour buses (Chicago, NYC, San Francisco) don’t extend it to the suburbs. @Tim: the 174 is being split at S 154th St. The northern part will be renumbered to the 174. The southern part will be converted to the “A” next year. Such a long route should have been split long ago, because congestion at any part is magnified by the length of the route. Look at my photo in the Flickr pool, it’s a more complete picture. It’s under Late Night/Early Morning: 10 pm – 6 pm Bus departs approximately every 30 minutes. 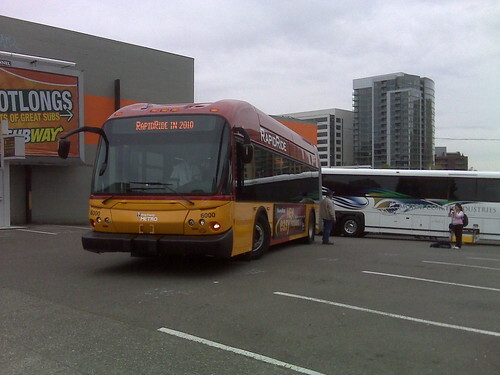 See http://metro.kingcounty.gov/up/sc/plans/2009/012009-swkc-phs-ib.html for proposed changes to SW King County service. For RapidRide it says Evening service: 15-30 minutes, 2-3 owl trips. I don’t know Metro’s definition of an “owl” trip, any trip that leaves between 2:15-3:30 am? Ah yes, now I remember reading that article. A lot of people are going to be pissed at that split. While waiting for the 194 downtown, I’ve heard people talking of their ride on the 174 to just south of the airport. Forcing a transfer = not good. Oh well, they can start riding LINK down to Tukwila/International Blvd. Did anyone get to hear one of these running? How loud is it? Its just like one of the 6800’s (newest hybrid artics) except for that funny nose. Where is that demonstration stop, and is it going to stay there for people to look at? And is the bus parked somewhere for people to ooh and aah at it? 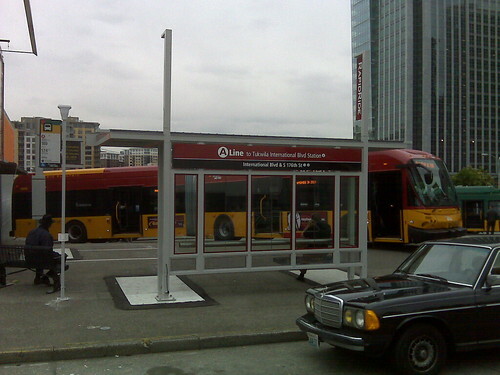 Also, Community Transit unveiled the first Swift station. Unfortunately they only have one tiny pic. They say it will open on November 30. It (was) at 6th & Lenora. I wasn’t there yesterday, couldn’t make it down there today, and probably can’t tomorrow either. My guess is that they moved the bus back to whatever base its being stored at to prevent vandalism. Probably moved back to South Base where the 174 is based out of. is it just me or is RapidRide color scheme / visual style horrendously ugly? Oh joy. Another system. More ugly vehicles. More stupid names. More bad logos. More bad signage. Why is the Northwest a black hole for good design as it relates to transit? I hear a lot of complaints about all of these systems, yet not one person who has commented has come up with an actual SOLUTION to the problems people are talking about. 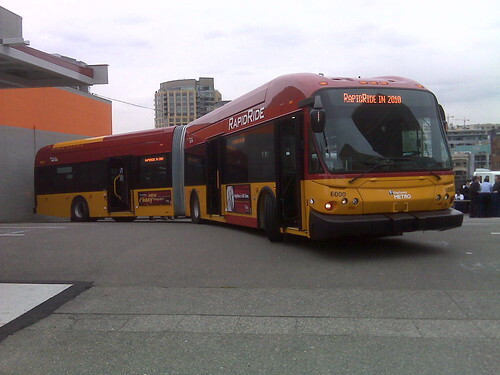 The RapidRide system will have 10 minute headway during peak operating hours and 15min any other time. 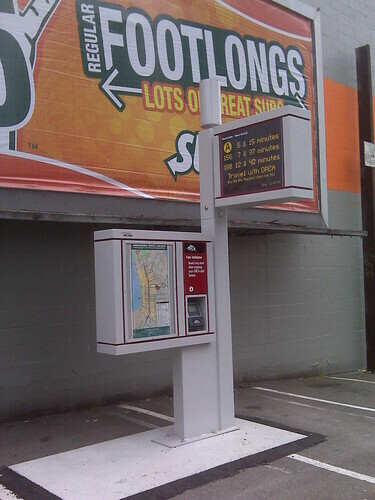 The systems will have dedicated lanes and the ability to communicate to traffic signals to accomodate their flow. Which could increase traffic back up, but likely won’t since the lights aren’t going to extend for much longer than the time it takes to bus to pass through. You can pay the fare before you board and hold a transfer-like ticket that will be your ride pass. That speeds up loading considerably. If everyone would stop name calling and acting like children, perhaps actual adult conversations can happen around solutions. There will always be a flaw in a system. Learning to adapt to those flaws and work with them is the goal.